Looking for a Trusted Shutter Company in Tavares? American Blinds and Shutters Outlet offers quality exterior shutters and durable storm shutters to protect your Tavares home during the next hurricane or other major storm. Their storm shutters are available in a variety of colors and materials, so you won’t have to sacrifice style for security. Their experts will work with you to select the ideal storm shutters to protect your home and belongings from wind, rain, and debris. American Blinds and Shutters Outlet also specializes in durable, easy-to-maintain Polycore exterior shutters, a superior alternative to wood or vinyl for outdoor shutters. American Blinds and Shutters Outlet offers an exciting variety of customizable interior window covering options for your Tavares home. They can create custom draperies and curtains using an almost endless variety of fabrics to coordinate with your unique interior décor style. They also create custom window shades, including woven wooden shades that add an interesting flair. Wood or faux-wood blinds can allow you to modulate the lighting levels in rooms, letting in that perfect amount of light. 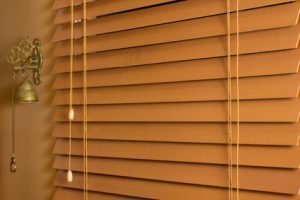 American Blinds and Shutters Outlet also offers classic Venetian blinds in fabric, paper, canvas, and vinyl materials. Whether you’re interested in luxuriant aesthetics, or durability and easy maintenance, they’ll help you find the perfect coverings to coordinate your interior windows with your unique personal style. If you are considering a shutter company in Tavares, FL, then please call 407-492-1009 or complete our online request form to schedule a free consultation.